Transparent steam engine for demonstrating how an oscillating steam engine operates. In this engine the cylinder moves around a center axis. This motion causes the inlet port and outlet port of the steam conduit to open and close. 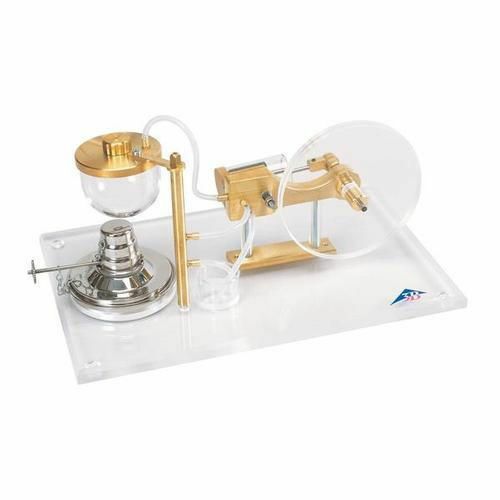 The base plate and flywheel are made of acrylic glass, while the boiler and working cylinder are made of heat-proof quartz glass, making all of the moveable parts and actions very clearly visible. With a ball bearing supported crankshaft made of brass and a safety valve built into the boiler to prevent excessive pressure. Includes spirit burner with adjustable wick for use as heat source.